French phrasebook has been nominated for featuring on the main page as Featured Travel Topic. We may have failed to notice some minor glitches in the article. Please plunge forward and help improve it further before it hits the main page. French (français) is a Romance language, and one of the most widely spoken languages in the world: 220 million people speak French, including 115 million native speakers. The French language originated in France, but in the modern day it is spoken all over the world; it is an official language of 29 different countries, an important business, cultural, or minority language in dozens of other countries and regions, and is used officially by scores of international organisations including the United Nations, the European Union, and the International Olympic Committee. Although it's been largely supplanted by English these days, French was the main international lingua franca well into the 20th century, and at one point, French was the language spoken in most of the royal courts of Europe. To this day, it remains de rigueur for educated people in many societies around the world to have some level of basic French ability. Aside from France itself, French is widely spoken in many other parts of Europe, including the southern half of Belgium (Wallonia and Brussels), western Switzerland, Monaco and Luxembourg. A significant number of speakers are also found on most of the Channel Islands (Jersey, Guernsey, and Sark but not Alderney, where the local Francophone community died out some time after the Second World War), the tiny Pyrenean country of Andorra, and the Aosta Valley of northwestern Italy. 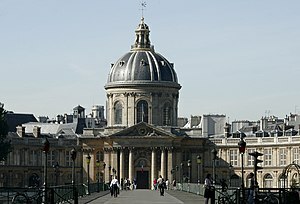 Like Spanish and German, but unlike English, the French language is governed by an official regulator - L'Académie française. Headquartered in Paris (shown here), the Académie issues guidance and recommendations on good French, and its occasional spelling reforms are often controversial. In the Americas, French is spoken primarily in the Canadian provinces of Quebec, New Brunswick, the northern and eastern parts of Ontario and around the Winnipeg area of Manitoba. Although Canada is an officially bilingual nation and there are Francophone enclaves in almost every province, outside these four provinces, it's quite rare to encounter anyone in Canada who speaks more than a few words of French without hunting down those off-the-beaten-track French-speaking communities. French is also spoken in a few parts of the United States, namely parts of Louisiana and northern Maine, New Hampshire and Vermont. French is also the official language of Haiti, Martinique, Guadeloupe, Saint Barthelemy, Saint Pierre and Miquelon, the northern half of Saint Martin, and French Guiana, all of which are, or used to be, French colonial possessions. Elsewhere, French is an official language of many former colonies in Africa. It is an important administrative and cultural language in the former French Southeast Asian possessions of Vietnam, Laos and Cambodia. In Oceania, French is the sole official language of New Caledonia, French Polynesia and Wallis and Futuna, which remain overseas departments of France today, as well as one of the official languages of Vanuatu. The varieties of French which are spoken in Belgium and Switzerland differ slightly from the French spoken in France, though they are similar enough to be mutually intelligible. In particular, the numbering system in French-speaking Belgium and Switzerland has some slight peculiarities that are significantly different from the French spoken in France. Nevertheless, all French-speaking Belgians and Swiss would have learned standard French in school, so they would be able to understand you even if you used the standard French numbering system. There are many differences between the French spoken in Quebec and that spoken in France. The two main differences are that Quebec has retained many 18th- & 19th-century French words, while in France the language has incorporated many English words. Nevertheless, all Francophone Canadians, including Quebecois, learn standard French in school. This means that while you may not understand conversation among locals, they will be able to converse with you in standard French if required. Aside from Europe & Canada, many French-speaking regions have incorporated the words of local languages and on occasion have formed distinctive dialects or languages known as Creoles. The French Wikivoyage has a page that can help you locate French-speaking regions. French verbs conjugate differently according to tense, mood, aspect and voice. This means that there are many more possible conjugations for French verbs than English verbs, and learning how to conjugate each verb in different scenarios can be a challenge for English speakers. French nouns are divided into 2 different genders: masculine and feminine. Unlike in English, all inanimate objects have a gender assigned to them (eg. pain (bread) is masculine; comédie (comedy) is feminine), and the article of each noun depends on its gender: le (m), la (f) or l' (before words starting with h or a vowel, regardless of gender). The plural definite article is les, for all genders. Similarly, third person pronouns also depend on the grammatical gender of the subject: il (m) or elle (f), with ils and elles being the masculine and feminine plurals, respectively. When there are groups of mixed-gender people or objects, ils is always used. The grammatical gender of nouns denoting persons generally follows the person's natural gender (eg. mère (mother) is feminine, père (father) is masculine), though some nouns are always of the same gender regardless of the natural gender of the person they are referring to (e.g. maire (mayor) is always masculine even if referring to a female mayor, personne is always feminine even if the person in question is a man). In French, there are two equivalents of the English word "you". In informal situations, and when addressing children or pets, the word to use will be tu, while in formal situations, or when addressing a group of people regardless of circumstance, the word to use will be vous. It is important to know the distinction, as while addressing a pet dog with the vous form would sound ridiculous and be likely to amuse, using tu in a formal situation would be inappropriate and may offend the person whom you are addressing. After initially using the vous form, a person may say to you "On peut se tutoyer"; this is a polite invitation for you to use the tu form with them. The default title used when addressing a man is monsieur, while a woman would be addressed as madame. Mademoiselle was traditionally used to address young, unmarried women, but this is now controversial and arguably sexist, so unless the other person tells you otherwise, it is best to default to madame. The respective plurals are messieurs and mesdames, so the French equivalent of "ladies and gentlemen" would be "mesdames et messieurs". French is often called the "language of Molière". The Parisian playwright is celebrated in stone on the city hall of his hometown. Like that of English, and unlike almost all the other Romance languages, French spelling is not very phonetic. The same letter used in two different words can make two different sounds, and many letters are not pronounced at all. The good news, though, is that French generally has more regular pronunciation rules than English. This means that with sufficient practice, one can generally pronounce written French fairly accurately. However, the large number of homophones and silent letters make it such that attempting to write down spoken French often results in spelling mistakes, even for native speakers. The final consonants of a word are usually dropped: allez (go) is pronounced al-AY, not al-AYZ; tard (late) is pronounced tar, not tard. But if the next word begins with a vowel, the consonant may be pronounced; this is called liaison. A final 'e' is also usually silent if the word has more than one syllable, except in parts of southern France, especially Toulouse. Stress is fairly even in French, but the stress almost always falls on the last syllable. For many French words, it is impossible to write something which, when pronounced as English, sounds like the French word. Use the transliteration as a guide to liaison and the French spelling to pronounce the vowels. Vowels in French can have accent marks, which generally have no noticeable impact on pronunciation, but they often distinguish between homophones in writing (ou, meaning or, and où, meaning where, are pronounced the same). The only really important one is é, which is always pronounced "ay", and changes the meaning of the word. in most cases a central neutral vowel ("schwa") like "a" in "about", sometimes not pronounced at all, sometimes like "é" or "è"
a bit like "eu" but more "open". The distinction between œ and "eu" is very subtle and often irrelevant. Most final consonants are silent except for c, q, f, l, and r (except in the combination "-er", normally found in verb infinitives). Sometimes, final consonants that are normally silent would be pronounced if followed by a word which starts with a vowel, a phenomenon known as liaison (eg. mes amis would be pronounced MEH-ZAH-MI). The plural ending "-ent" for verbs is never pronounced, though it is pronounced in other words. When there is an accent mark on "e", it prevents diphthongs. Letters should be pronounced separately, following the rule for the accented letter. Example: énergumène, (rowdy character), réunion (meeting). A diaeresis (¨) may also be used to prevent diphthongs on "e", "u" and "i". Example: maïs (Indian corn or maize). In the combinations "gue" and "gui", the "u" should not be pronounced: it is there only to force the prononciation of "g" as in "go". If the "u" is pronounced, a diaeresis is added on the 2nd vowel in older texts (eg. aiguë (sharp)), or on the u in official texts after 1990 (eg. aigüe). In the combination "geo", the "e" should not be pronounced, it is only there to force the prononciation of "g" as in "sabotage" (in the case the "e" should be pronounced, it is indicated with an accent mark as in géologie). Comment vous appelez-vous ? (koh-moh vooz AHP-lay VOO? ); lit. "How do you call yourself?" I can't speak French [well]. How do you say _____ in French / in English? My things have been stolen. un million (ung mee-LYOHN) (treated as a noun when alone: one million euros would be un million d'euros. The French use the 24-hour clock, with midnight being 0h00 (except on digital clocks, in France an 'h' is used as a separator between hours and minutes as opposed to a colon in many other countries). However, the 12-hour clock is making some inroads and saying 1-11 in the afternoon or evening will be understood. French calendars normally start on Monday. Like in other Romance languages, nouns in French are either "masculine" or "feminine"; adjectives vary accordingly. For instance, a lady may be « blonde » or « brunette » while a gentleman with hair of the corresponding hue is « blond » or « brunet ». Where is / are _____? ...the nearest metro / subway / underground station? ...the town / city hall? ...le syndicat d'initiative ? (luh SAN-dee-kah dee-NEE-sya-teev) // l'office du tourisme ? // (Quebec) le bureau touristique? ...the nearest bank / ATM / automated teller? Please could you show me it on the map? Can you change it (the money) for me? Where can I get it (the money) changed? Where can I find a cash point / ATM? des fruits de mer (deh frwee duh MEHR); literally: "fruits of the sea"
du porc/cochon (dü POHR/dü coh-SHONG). cochon is much less formal. Note: If you ask for "water", you will get mineral water. To specify "tap water", say "eau du robinet" (OH doo roh-bee-NEH) or ask for a carafe of water "une carafe d'eau" (OON cahr-AHF doh). Excuse me, waiter / waitress? Note: "garçon" (boy) is offensive and should be avoided. Can you please clear the plates? I do not eat eggs, milk, or cheese. I do not eat meat, chicken, or pork. I do not eat _____. I only eat kosher / halal food. I want to talk to the American/Australian/British/Canadian embassy or consulate. [offering bribe] Will you accept this in place of my fine? Note: Only consider attempting this in third world countries. Do not try to do this in European Francophone countries or in Canada as it will get you in worse trouble! This French phrasebook has guide status. It covers all the major topics for traveling without resorting to English. Please contribute and help us make it a star! This travel guide page was last edited at 23:23, on 21 April 2019 by Wikivoyage user AndreCarrotflower. Based on work by Wikivoyage users ARR8, Ikan Kekek, The dog2, Ground Zero, ThunderingTyphoons!, Assassas77, Traveler100bot and AtlasDuane, Wikivoyage anonymous user 204.10.63.4 and others.